As always, the book is also available directly from the Packt Publishing online store. If you want to know what the book is about, here’s a detailed description: I definitely hope that you will like it just like you did with the previous one, who was a best-seller in multiple countries with more than 5000 copies sold throughout the world! That couldn’t be made possible without you, so thanks again and… get ready for another development journey! Build a complete single page application with two of the most impressive frameworks in modern development, ASP.NET Core and Angular. Bring together the capabilities and features of both Angular 5 and ASP.NET Core 2 for full stack development. Full-Stack Web Development means being able to work on both the front-end and back-end portions of an application. Front-end is the part the user will see or interact with, while back-end is the underlying engine which handles the logical flow: server configuration, data storage and retrieval, database interactions, user authentication and more. 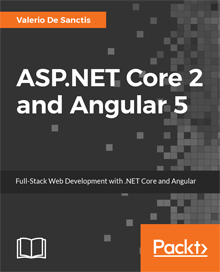 This book will guide the reader to become proficient, if not fluent, in both of these worlds by combining the impressive capabilities of ASP.NET Core 2 and Angular 5. Get ready to experience a journey of the entire development process using a full-stack approach, from the project setup to the deployment phase: using the ASP.NET MVC Framework to implement the back-end API calls, Entity Framework Core to build the Data Model, then Angular 5 to put together the front-end. You’ll be able to take full control of your solution by choosing and configuring the development tools accordingly along with the main architecture. You will then implement the back-end with MVC, APIs, server-side routing and request-response cycle and also implement the front-end with Angular 5. Later on, you will build the Data Model with Entity Framework Core and style the front-end with Bootstrap and CSS/LESS for a responsive, mobile-friendly UI. You will go through Forms and Validation and different Authentication and Authorization techniques, including Third-Party Authentication using OAuth2 providers such as Facebook. At the end, you will go through the final steps of Deployment using Windows Server, SQL Server, and the IIS/Kestrel reverse proxy. Use ASP.NET Core to its full extent to create a versatile back-end layer based on RESTful APIs. Consume the back-end APIs with a next-generation front-end framework such as Angular 5. Implement an authentication/authorization layer using ASP.NET Identity featuring integrated and third-party OAUTH providers. Configure the web application in order to accept user-defined data and persist them into the database using the server-side APIs. Apply some useful ASP.NET Core coding best practices to write better code. Secure your application and perform the testing phase in a time-efficient way. Make all the different aspects of the ASP.NET Core framework tools work together, blend together and interact with each other.